Compatible Epson 33XL (T3351) high capacity, high quality Black ink cartridge. Replaces Epson 33XL Oranges Cartridges. Compatible Epson 33XL (T3361) high capacity, high quality Photo Black ink cartridge. Compatible Epson 33XL (T3362) high capacity, high quality Cyan ink cartridge. Compatible Epson 33XL (T3363) high capacity, high quality Magenta ink cartridge. Compatible Epson 33XL (T3364) high capacity, high quality Yellow ink cartridge. The Epson XP-645 is an all-in-one inkjet printer that is able to scan, copy, fax as well as print.It is an attractive modern looking machine that would fit perfectly for a home office. The printer is an ideal solution to print high-quality photos and text documents at home with printing resolution up to 5760 x 1440 dpi (colour and mono). On the tilting control panel, it has a 2.6 inches colour LCD screen which makes it easy to use and navigate. It is a compact and lightweight machine as it measures just 15.3 x 13.4 x 5.4 inches and weighs an approximate 6.7kg that makes is easily portable. A front-facing SD card reader slot is also provided that making printing directly from the camera with great ease of use. The printer uses individual Epson XP-645 Ink Cartridges, allowing to replace the cartridge easily. The printing speed is 32 pages per minute which is great for a home printer in both options coloured and mono.The machine is Wi-Fi enabled so that one can print directly from one’s handheld device such as a smartphone or tablet, without having to plug anything in. It creates high quality photos and crisp, clear text documents with its individual inks and easy-to-use features. Epson 33XL (T3351) Black ink cartridge. 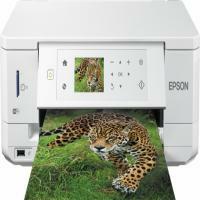 The Epson XP-645 printer is a budget printer designed for the home offices. It is suitable for a user who is looking for all in one reliable printer that can print photographs and general documents at home. How to resolve various problems encountered during the setup of the machine? Q. How long is the life of the Epson XP-645 ink cartridges? One of the factor is whether the cartridge is kept in proper environmental conditions or not. If a cartridge is kept sealed in its original packing in which it comes, and stored in a cool and dry place, should last for minimum 2 years. It also depends on the kind of wear and tear over the time period when it is in use. If you do a lot of colour printing, the ink cartridge will get empty soon. Q. I need an individual colour ink cartridge for my printer as only my Magenta ink is empty. What is the price of compatible EPSON XP-645 Ink cartridge if I order only single ink cartridge from this site? A. The price for the compatible cartridges is €10.95 Inc. VAT for any of the individual colour cartridges. To know more about this ink cartridge, visit this page: https://printerinkcartridges.ie/epson-33xl-magenta. Q. What is the ink volume of compatible EPSON XP-645 Ink cartridges of your site? A. At Printerinkcartridges.ie, the ink volume of black ink cartridges is 12.2 ml and coloured ink cartridges is 8.1 ml. Q. Does the printer allow printing from phone or tablet? A. Yes, the printer allows printing from phone or tablet by using Google cloud and Apple Airprint. Q. Does the printer support automatic duplex printing? A. Yes, the printer comes with automatic duplex printing as standard. Q. What is the print speed of the printer and the printing resolution for coloured and mono documents? A. The printing speed of the printer is upto 15 ppm for mono and 7.2 ppm for coloured documents with the print resolution of 5760✕1440 dpi. Q. I have two printers in my office. One is Epson XP-640 and the other one is Epson XP-645. The ink cartridges for my XP-640 have ran out. In that case can I use the Epson-645 ink cartridges in the machine? I am not sure about it. Please suggest. A. The Epson XP-645 ink cartridges are compatible with the Epson XP-640 printer. You can use the ink cartridges without any worries. Q. My Epson XP-645 is printing at an annoyingly slow speed. I need to get plenty of sheets printed and this machine is just wasting my time. Is there anyway I can resolve the issue quickly. Please help. A. If your printer is taking too long to print please follow some steps below to quickly resolve the issue. If you have been using the printer continuously for a long time then it may happen that the printer might slow down to protect the print mechanism from overheating or damage. Hence, let the printer rest for about 30 minutes with the power on. After 30 minutes you can try printing again. These solutions will definitely help resolve the issue. Q. The Epson XP-645 ink cartridge multipack contains two black colour cartridges. Why is that so? A. Yes. Two black ink cartridges are provided for the Epson XP-645 printer. One black cartridge is the ordinary one for regular printing needs and the other one is a smaller size photo black ink cartridge that is used for enhanced photo printing. Q. While taking a printout using my Epson XP-645 printer, the paper did not eject properly and got wrinkled. What is the problem associated with it? A. If the paper is not ejected properly, then you need to press the Stop button of your printer. Then open the scanner unit and remove the paper. Check if the Paper Size that you have selected is correct. Make sure the paper you are using meet the required paper-handling specifications. Q. Hi, I am unable to print photos from my memory card. I am using Epson XP-645 printer for printing. What should I do? A. Check in case you have inserted more than one memory card in the slot. Also, make sure that the memory card must be compatible with your printer. Make sure that the files you are trying to print from the memory card are of the proper format. In case you are trying to print too many photos at the same time, then you will not be able to see all the photos. You need to select a small group of photos to get the print without any bands, streaks or breaks. This will enable easy method of printing and you will get an improved quality photos. Q. Hi, I am using Epson XP-645 printer, and the printer message shows insufficient coloured Epson XP-645 Ink Cartridges. Can I still carry out printing using black Epson XP-645 Ink Cartridges? A. Yes, you can temporarily print by using black Epson XP-645 Ink Cartridges. For this first cancel all the print job and select plain paper or envelope to take a test print. Then load plain paper or an envelope in your printer by selecting the Main tab and then Plain Paper/Bright White Paper or Envelope as the paper type setting. Then you need to select the Black/Grayscale checkbox and then click OK. Then try printing your document. You will see a print message. You need to click on Print in Black to print the document. Q. Hi, I am using Epson XP-645 printer. I would like to restore the colours of some of the old photographs that have got faded. How can I do that? A. You need to scan the faded photographs by changing the image adjustment settings to restore the colours. To select these settings, first, place your original photograph on your printer for scanning. Then start scanning by selecting the scan mode based on your preference. Then preview your image and access the image adjustment settings. Check the Colour Restoration checkbox and finally click on Scan. The colour-restored file will be saved in the selected folder and you will get the improvised quality of the photographs. Q. Hi, I am going to relocate and I would like to take my Epson XP-645 printer with me. What all precautions should I take to transport my printer safely? A. Firstly, check if the print head is placed at the far-right position. Remove the papers and close the output tray and scanner unit. Turn off the printer and lower the control panel with the help of the release bar and push the panel down. Place it properly into the package or there are chances that the Epson XP-645 Ink Cartridges may leak. Also, leave the Epson XP-645 Ink Cartridges installed as removing the Epson XP-645 Ink Cartridges may cause the ink to dry the printhead and may cause a problem when next time you do a print task. Make sure that you have done proper cushioning around the printer. While again using the printer clean and again align the printhead.